Driving from Manzanillo to Troncones was pretty slow going, back on the 200 and following the coast. It’s only about 400ks but it took us over six hours. Lots of small towns, speed bumps (Topes) and gnarly sections averaging about 65 km/hr. We hit Troncones in the Lowest of low season, rainy and slow. Battled off our second spider invasion finding nests with thousands of little spiders all through our gear and in the car – we fumigated the car with 6 mosquito coils for two days straight. 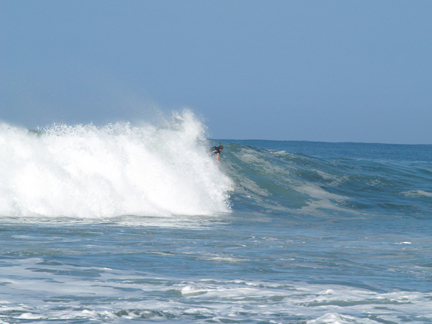 Surfed Manzanillo bay in Troncones – A big lefthander that peels off the point and into the bay, a really sweet setup … had it all to myself.